Tim Burton’s delightful Frankenweenie is a harmless comedy horror starring one of the most adorable dogs to grace celluloid. The film is packed with excellent characters, voiced by an excellent cast. This stop motion animation is yet another fine Burton production which is sure to charm and entertain almost all age groups; under-6s could quite possible be a little scared! 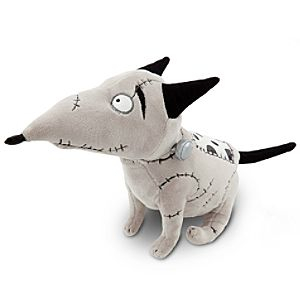 We laughed a lot watching Frankenweenie and we all fell in love with him. In fact, we were so enamoured, we ordered our very own from the Disney Store! Don’t say we’re not a serious film review site!! You can find more information on this U.S. production on Wikipedia and IMDb. I love Tim Burton’s dark and strange universe ! Thank you so much for following my blog and for all your “Likes” ! Greetings from Marseille, France ! Awesome! I liked the little yellow dudes from Despicable Me so I might have to buy one of them. I am a 28 year old male. Does this mean I am a bit immature? Or just a geek? I like being a geek. Watched this with my family on my daughter’s birthday. We all loved it! cool blog, thanks for that! keep it short it’s nice 🙂 why don’t you tag the name of the director (I was looking for other Burton’s movies that yo would recommend) and maybe tag the main actors too? def watching Frankenweenie this weekend, thanks for the reminder! Too many tags spoil the blog! Our family watched this a few months ago and really enjoyed it. My 12 year old daughter and I both thought there were some really great visuals in this film. Great choice. With Master Burton all goes well. There are a few people I can always count on for quality and entertainment – he”s one of them. This was a most excellent and funny film! I still want to see this one, but I keep mentally mixing it up with ParaNorman – I think they came out around the same time? That’s right, Dawn. 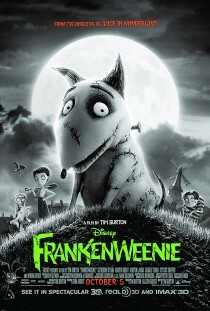 ParaNorman was released August 2012 and Frankenweenie October 2012. As christopherjamespatton did, I also recommend you to watch ‘Perfect Blue’, as it’s one of the best “anime” movies I’ve ever seen, definitely. I feel like the best stuff Tim Burton’s done in the past couple decades has been animated stuff, he should probably do it more. I ususally can’t stand musicals but I thought Sweeney Todd (2007) was amazing. And I really enjoyed Big Eyes (2014). Have you seen Coraline (2009)? It’s directed by Henry Selick who Selick made his feature-directing debut with Burton’s production of The Nightmare Before Christmas (1993). I highly recommend both of these films if you haven’t seen them! Yeah, I’ve really been wanting to check out Coraline lately. I’ve just bought the novel. It’s supposed to be really scary. I just need to wait to get those stop-motion characters out of my head first!